The Centers for Disease Control and Prevention (CDC) have released new recommendations to promote physical activity by implementing a combination of transportation and land use interventions. The recommendations stem from the Community Preventive Services Task Force (CPSTF), an independent panel of 15 public health and medical experts appointed by the CDC Director with the objective of identifying evidence-based interventions to improve health and quality of life. The panel includes distinguished doctors, professors, and researchers with expertise in health promotion and disease prevention. They conducted a comprehensive review of 90 studies examining the relationship between the built environment and physical activity to determine how best to promote exercise. Their new recommendations are an important step forward to understanding the linkages between health-related behavior and how we build our towns and cities. Getting enough exercise reduces the risk of obesity, heart attack, stroke, Type 2 diabetes, and certain cancers. It also improves mood, bone strength, and quality of life. Despite this, most adults and a substantial majority of adolescents fall short of daily guidelines for physical activity. Now more than ever, it is vital to understand how we can most effectively encourage people to get out and active. 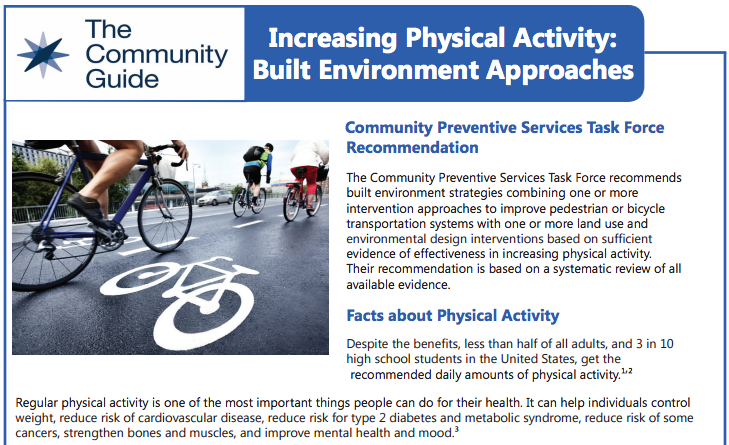 CPSTF’s new Community Guide recommends implementing changes to the built environment that provide opportunities for physical activity during free time and as a means of transportation. 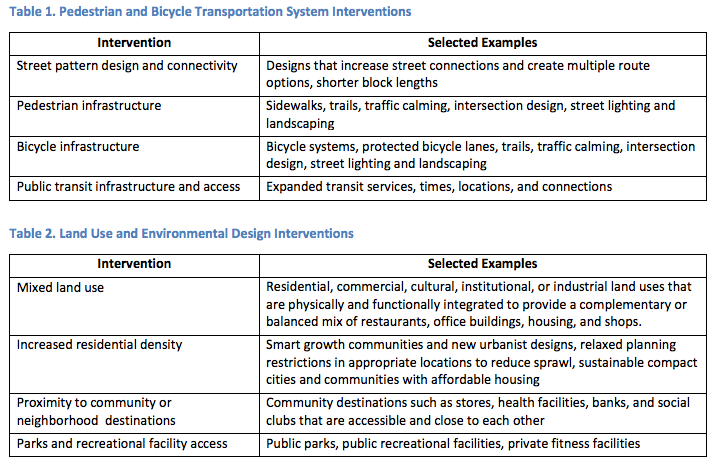 These interventions fall under two distinct categories that should be undertaken concurrently: transportation system interventions, specifically focused on pedestrian and bicycle infrastructure, as well as land use and environmental design strategies. The recommended transportation system changes align closely with a Complete Streets approach. These include improving street connectivity and providing safe, accessible infrastructure for walking, biking, and riding public transit. The land use recommendations in the Community Guide embody the principles of smart growth by encouraging compact, mixed-use development with convenient access to parks, healthcare, schools, jobs, and other vital resources. Establishing a linkage between transportation and land use is critical not only for physical activity and health, but also for economic productivity, air quality, safety, community cohesion, and the enjoyment of vibrant, livable public spaces. On a large scale, reorienting our transportation systems to provide safe, convenient opportunities for physical activity while simultaneously shifting our land use patterns to support compact, mixed-use development will lead to a long-term, sustainable impact on human and environmental health as well as significant savings in healthcare costs. Implementing these strategies on a smaller scale can also be undertaken quickly and at a reasonably low cost as a starting point for continued, incremental change. CPSTF’s new recommendations also acknowledge ongoing challenges and gaps in our knowledge of how the built environment impacts health. For example, we still do not fully understand which combined transportation and land use interventions will be most effective at promoting physical activity, nor do we know how effectiveness will vary depending on the context. We also need more research on if and how these impacts differ depending on population characteristics like race, ethnicity, and socioeconomic status. Finally, implementing these strategies in rural settings will require innovative approaches to overcome long travel distances and shortages of public transit infrastructure. Nonetheless, these recommendations open the door to powerful partnerships between transportation, land use, and public health advocates and practitioners. Smart Growth America and the National Complete Streets Coalition are excited to continue providing support, advocacy, and technical assistance for transportation and land use strategies like the ones recommended by CPSTF. We are enthusiastic that these recommendations will motivate states, regions, and municipalities nationwide to better address connections between the built environment and physical activity in the pursuit of creating healthier, more livable places.